Fancy your own wine label? Being able to rock up to a social evening and pop your “own’ wine on the table? Wax on about growing, curing and marketing wines? Well, this little fantasy is now very much “do-able” and within a short time, you could be a player (albeit on a very small scale!) in the wine business! 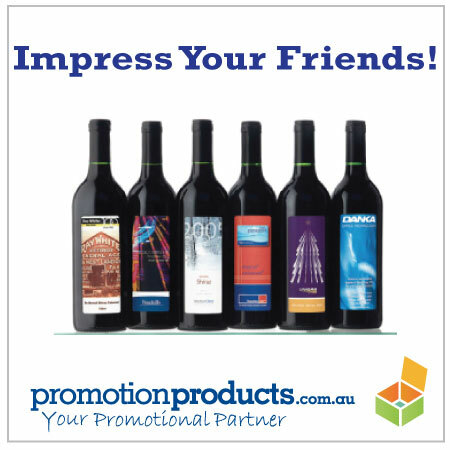 We’ve partnered with some great brands who feature all the time on OZ supermarket and bottleshop shelves, to bring you competitively priced wine from Australia’s stalwart producers. Except in this case, you’re forming your own label and essentially, via your distribution network to colleagues, clients and family, the birth of your very own wine club! The branding opportunities are immense – either you supply artwork for the face label or we can help blend your logo to a template (this is the most popular choice) and for a further cost, you can print to the back label. Whatever you deceide to print is fair game – it could be a picture of staff, company profile, team stats, event program etc. Being in the “custom wine” business is a fun and attractive way to win new and retain old clients (plus the family will appreciate a few “samples”)! This entry was posted in Australian, business gifts, Fun and Leisure and tagged catering, events, restaurant, wine by admin. Bookmark the permalink.